Diabetes Mellitus is one of the world’s biggest killers. The word “diabetes” means “passing through” and “mellitus” refers to honey or the sweet taste of sugar. It happens that those with diabetes urinate more frequently, and that urine is loaded with sugar, but this is just one of many symptoms of diabetes. The other symptoms include blurry vision, increased appetite or thirst, and extreme weakness. These and still more symptoms merely indicate that you may look forward to a long list of terrible consequences of full-blown diabetes: heart disease, obesity, liver failure, difficulty breathing, erectile dysfunction, yeast infections, joint problems, nausea, vomiting, convulsions, gangrene and ulcers leading to the amputation of limbs, coma, memory loss, nerve damage, premature aging and unfortunately, the list goes on and on. The medical community holds that there is no cure for diabetes, but there is evidence to suggest that diabetes is both preventable and reversible. My intention in sharing this information with you is that you will work together with your doctor to achieve the highest level of health, while using the fewest medications possible. A diagnosis of diabetes is always classified as being either “Type 1”, “Type 2” or “gestational”. Type 1, according to the vast majority of doctors, is the pancreas’ complete inability to produce insulin, and therefore requires a lifetime of direct insulin injections. Type 1 diabetes is sometimes referred to as insulin-dependent diabetes mellitus (or IDDM) and was previously called “juvenile-onset diabetes”. The medical community has been forced to drop the latter name because of the great number of adults that are developing Type 1 diabetes, and the great number of children that are developing Type 2 diabetes. Type 2 diabetes, according to mainstream literature, is when the beta cells of the pancreas can be stimulated to produce insulin, meaning that the “lucky” patient can swap a lifetime of needles for a lifetime of pills. “Gestational” diabetes affects only pregnant women and their babies. Although the mainstream medical community rejects the idea of curing diabetes, many responsible physicians do recommend that their patients adopt a healthy diet and lifestyle to prevent diabetes or slow its progression. There are several new and old treatment protocols that offer more than blind hope for those suffering with diabetes. Dr. Robert O. Young is a modern-day champion in the fight against diabetes. A microbiologist, Dr. Young uses a high-powered microscope to perform live-cell analysis on human blood. This process allows him to record the movement of the living blood. Using this technology, he re-discovered what a French scientist named Antoine Béchamp(1,2) had discovered about 100 years ago: that a blood cell can actually become a bacterial cell or a fungus cell (and can convert back to a regular blood cell) depending on the pH of the fluid that surrounds the cell. Both Béchamp and Young observed tiny organisms called microzymas, which can morph or transform themselves through a process called pleomorphism. Béchamp’s discoveries were mostly ignored for a century as the world erroneously followed Louis Pasteur’s Germ Theory. Pasteur blamed “external” invaders that could be killed with heat (pasteurization) and/or drugs (antibiotics). He ignored the possibility that disease was created internally. The Germ Theory lives on today, as it is compatible with big business: pasteurization allows mass-production of animal products in disgracefully dirty conditions, and the “external threat” of deadly germs creates a huge demand for pharmaceuticals. Recognizing the possibility that “the enemy is created within”, one is empowered to take personal responsibility for preventing and reversing one’s disease. That real healing can happen through proper diet and lifestyle is the nightmare of Big Pharma and Big Food. Dr. Young’s book, The pH Miracle for Diabetes is a blueprint for preventing and reversing diabetes. I have read, and thoroughly agree with the essence of Dr. Young’s message. In the book, Dr. Young describes the results that he observed in two small clinical trials, and provides a wealth of knowledge that he accumulated over many years of scientific study. His wife, Shelly Redford Young, provides 125 pages of recipes that can help anyone to improve their diet. Shelly’s recipes are nutritious, delicious and easy-to-follow. (Although I must confess to not having tried all of them since I normally create my own recipes with the freshest organic fruits and vegetables available to me.) I would recommend that you buy his book if you or someone that you care about is diabetic, or on the road to becoming one. Dr. Davis is a cardiologist that has seen thousands of patients with both heart disease and diabetes. Dr. Davis’ own clinical experience confirms what the medical literature already knew: that diabetes and heart disease often go hand-in-hand. In fact, that is an understatement. Having diabetes makes you about 60% more likely to suffer heart disease. Dr. Davis has authored the book “Wheat Belly”, which explains in great detail, the correlation between these two diseases. As the title of the book suggests, Dr. Davis recommends drastically-reducing our consumption of carbohydrates, and eliminating wheat altogether. According to Dr. Davis, a slice of whole wheat bread will spike your blood sugar more than a Snickers bar, and even more than eating a teaspoon of pure table sugar. Throughout the book, Dr. Davis does not spare any detail. He thoroughly describes the sequence of events from the instant that a carbohydrate enters your mouth, through the entire digestive tract, the creation of several types of lipoproteins and the formation of AGE’s (advanced glycation end products). Lipoproteins are proteins that carry lipids. They are often referred to (erroneously) as “cholesterol”. LDL stands for Low Density Lipoprotein, and is often referred to (again, erroneously) as “bad cholesterol”. Dr. Davis is crystal clear on this issue: LDL is only problematic when the LDL molecules are smaller than 25.5 nanometers. The more wheat, sugar and other carbohydrates we eat, the more of these “small” LDL molecules are created. Davis is equally descriptive on AGE’s, which are the true cause of aging. He explains that diabetics are among the unhealthiest people in this regard, as their high rate of glycation indicates that they are aging faster than the rest of us. He does not suggest that aging can be halted completely, but he does prescribe a method of slowing down the process as much as possible. Yes, eliminate wheat, and reduce sugar and grains. Doing so will protect you from premature aging, as well as diabetes and heart disease, according to Dr. Davis. The Kuna tribe of Panama also knows that diabetes is reversible, but they made this discovery without the benefit of a microscope. The Kuna rely on the advice of “Nele”, the Kuna doctor. I met Nele over a decade ago and have learned some of the Kuna’s most precious secrets. Nele prescribes a list of ten medicinal plants, all found abundantly in Panama, to reverse diabetes. Nele does not emphasize the value of any one plant, but rather, the synergistic value of many plants. In her words “trust not the plant, but the creator of the plants… attack the enemy not with one warrior but with many”. I have personally witnessed the dramatic and sustained lowering of blood sugar in Type 1 diabetics, after drinking just one cup of tea, made from just one of the ten plants prescribed by Nele. Although these observations appear miraculous to the observer (in this case, me), this type of “anecdotal evidence” is often disregarded by the medical community, which prefers to base itself solely on (expensive) randomized clinical trials. Both Nele and I are more than willing to cooperate in such a trial, but as of yet we are not connected with any diabetes clinic. The Lotus Lifestyle is a system that I created for living in balance, easily. You can read about The Lotus Lifestyle in detail if you wish. But for the purpose of this article, here is a short summary: There are nine essential elements to a healthy lifestyle: love, clean air, sunshine, natural spring water, an alkalizing (plant-based) diet, staying wiggly, detoxifying, meditation and dreaming. 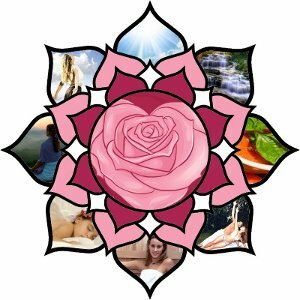 The simpler a plan, the easier it is to implement, so I have organized my plan into an 8-petaled lotus flower, which symbolizes beauty and balance… each of the eight petals symbolizes one of the elements that is necessary for obtaining wellness, and each springs from the core of the lotus, which is love itself. The nine essential elements that I describe in The Lotus Lifestyle are available to all, and it is possible to partake without spending a penny. The nine elements of The Lotus Lifestyle work synergistically to create a healthy, alkaline environment for the cells. My plan agrees with the good doctors (including Young and Davis) that vegetables and herbs are among the best sources nutrients, while grains and animal products are among the worst (because they acidify, and lead to diabetes). But my plan also emphasizes the importance of breathing clean air as deeply as possible, to increase the oxygen and eliminate acidic waste products from the cells. 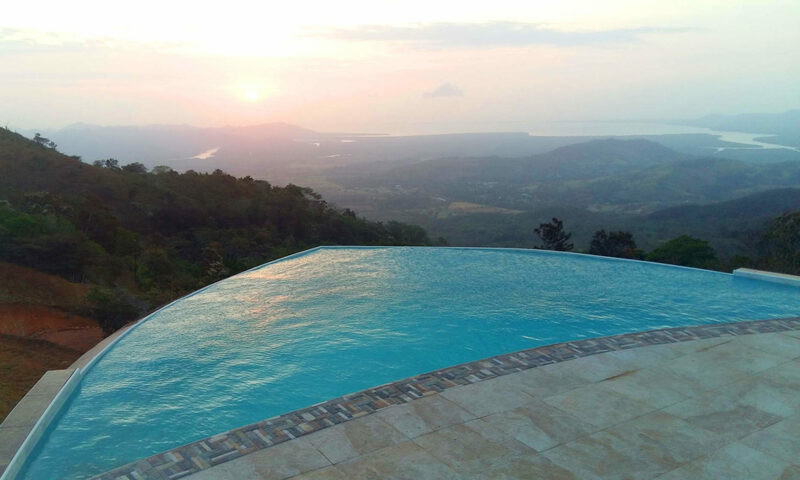 The other ‘petals’ of The Lotus Lifestyle, such as getting sunshine, clean water, and staying wiggly, are simple methods of keeping all systems in balance and functioning as nature intended. Cacao is among the most famous plants on Earth. Its name comes from the Greek, and means “food of the gods”. Cacao was used and cultivated by ancient Central American indigenous tribes such as the Mayas, Aztecs and Kunas as currency. Their abundant gold was used as a mere decoration as it could not be as valuable as that which produced health. Modern scientists are re-discovering the many medicinal uses of antioxidant-rich cacao, including its ability to fight cancer, heart disease, type 2 diabetes and depression, while stimulating cognitive function, improving memory and intelligence. 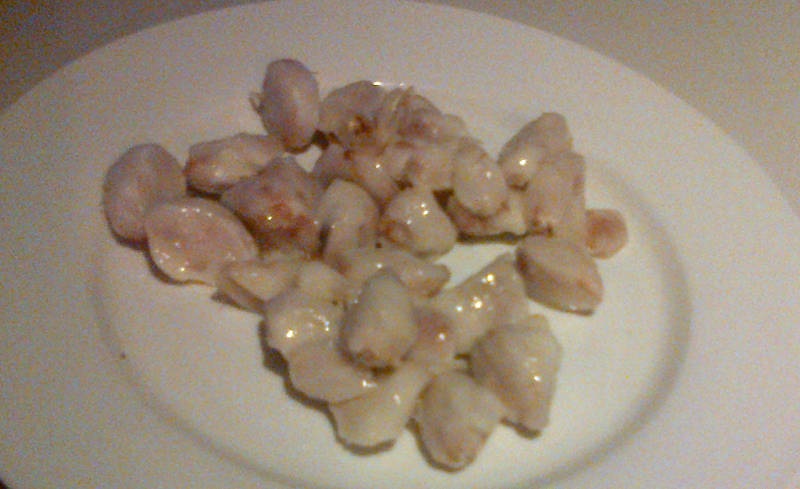 Cacao is the most important component in the production of chocolate. While commercial chocolates often contain copious amounts of sugar, cow milk and other addictive and toxic substances, it is certainly possible to produce a high quality chocolate using only healthy ingredients like cacao, coconut, and a natural sweetener like stevia, honey or maple syrup. Other recent studies have shown a positive effect on cholesterol, cough, weight loss, eczema, heart disease, high blood pressure and skin care. In my wellness center, several female clients reported an absence of PMS symptoms following a chocolate therapy administered prior to the expected onset of the monthly symptoms. This chocolate therapy consisted of painting dark chocolate sauce on the patient from head to toe, allowing the skin to absorb the nutrients, as well as inhalation of the chocolate aroma, and a small amount of this same chocolate mixture was consumed. Chocolate has long been considered an aphrodisiac and a mood-enhancer. Raw cacao stimulates the production of endorphins, dopamine, and serotonin, important neurotransmitters that block pain while creating pleasure and relaxation. Endorphins are our natural pain relievers; when pain suddenly disappears, a feeling of euphoria takes its place. Dopamine produces a feeling of joy with heightened focus and attention. Serotonin is our natural anti-depressant and it is important for relaxation and sleep. Each of these neurotransmitters are needed for good physical and mental health. Higher-than-normal levels of these neurotransmitters is likely to produce a feeling of intense pleasure and euphoria. It is important to keep both sides of this coin in proper perspective. While decreasing pain and increasing both pleasure and relaxation are normally welcomed benefits, relying on any one nutrient to stimulate these natural functions can lead to addiction and unpleasant withdrawal symptoms if consumption ceases. In other words, cacao may be considered a medicine, and it is important to regulate the dosage. An excess external stimulation may cause the body to under-produce on its own, which would explain the withdrawal symptoms. The Chicago Sun Times reported that people who suffer extreme depression have an irregular production of phenylethylamine or PEA, an amphetamine that stimulates dopamine receptors and increases mental alertness, pulse, blood pressure and blood sugar levels. When we fall in love, our brain naturally releases phenylethlamine, producing so much pleasure that it can be addictive. The heartbroken may self-medicate by binging on chocolate since chocolate is high in phenylethylamine. Theophylline is a stimulant of the heart and central nervous system, relaxes the bronchial smooth muscles, and may be effective in preventing and treating apnea in premature infancy. Anandamide is an endocannabinoid. Endocannabinoids occur naturally in the brain, but are most concentrated in the cannabis plant, and to a much lesser extent in cacao. Pictured above is an entire cacao pod, which grows directly from the trunk of a tree in Central America. 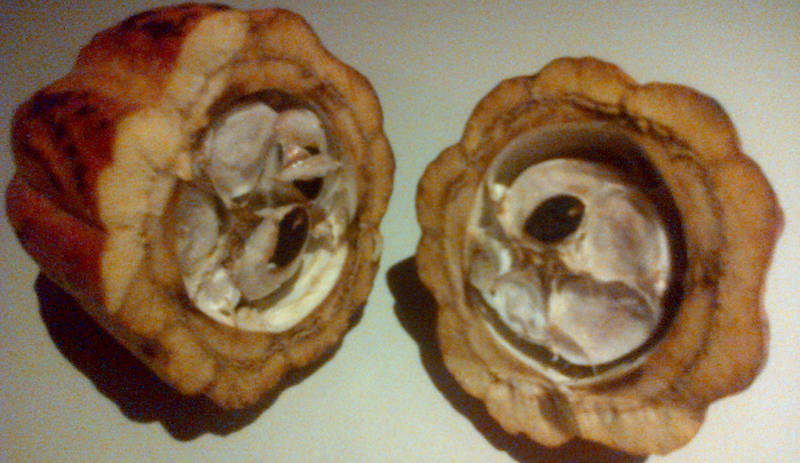 The picture above shows the cacao pod sliced in half, revealing the seeds covered in a sweet gooey white gel. Pictured above are the raw seeds covered in white slimy gel. This sweet gel may be the key to prevention of cancer and heart disease as it is consumed by the indigenous tribe that does not suffer either of these degenerative diseases. There are almost no studies on the consumption of the gel, most probably because developed countries normally only receive the processed cacao and have never had access to the fruit in its raw form. 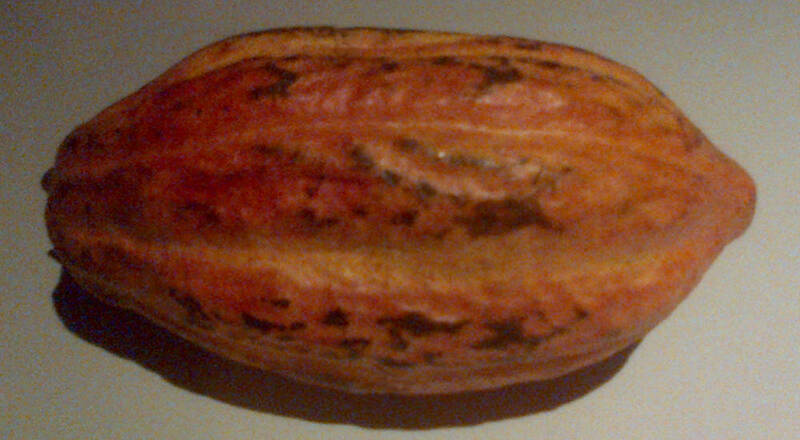 The scientific name of the chocolate fruit is “Cacaotero Theobroma”. Its chemical composition includes a large number of vitamins, amino acids and other phyto-nutrients… over 300 compounds in all. The flavor components include polyphenols, aliphatic esters, unsaturated aromatic carbonyls, pyrazines, diketopiperazines, and theobromine. Per 100 grams, the seed contains 456 calories, 3.6 grams of water, 12.0 grams of protein, 46.3 grams of fat, 34.7 grams of total carbohydrate, 8.6 grams of fiber, 106 mg of calcium, 537 mg phosphorus, 3.6 mg iron, 30 mg beta-carotene, 0.17 mg of thiamine (Vitamin B1), 0.14 mg riboflavin (Vitamin B2), 1.7 mg niacin (Vitamin B3), and 3 mg ascorbic acid (Vitamin C). Wealth of India reported that the edible pulp of the fruit contains 79.7–88.5% water, 0.5–0.7% albuminoids, astringents, etc. ; 8.3–13.1% glucose, 0.4–0.9% sucrose, a trace of starch, 0.2–0.4% non-volatile acids (as tartaric), 0.03% Fe2O3 and 0.4% mineral salts (K, Na, Ca, Mg). Raw seeds contain 0.24 mg/100 g thiamine, 0.41 riboflavin, 0.09 pyridoxine, 2.1 nicotinamide, and 1.35 pantothenic acid. Cocoa also contains about 18% proteins, fats (cocoa butter), amines and alkaloids including theobromine (0.5 to 2.7%), caffeine (ca 0.25% in cocoa; 0.7 to 1.70 in fat-free beans, with forasteros containing less than 0.1% and criollos containing 1.43 to 1.70%), tyramine, dopamine, salsolinol, trigonelline, nicotinic acid, and free amino acids; tannins; phospholipids; and more. To compare the amount of caffeine in a 6 oz cup of various beverages, I rely on information from Tyler and Palotti (6,7). Chocolate Consumption, Cognitive Function, and Nobel Laureates, Franz H. Messerli, The New England Journal of Medicine, October 18, 2012. Cacao es una de las plantas más conocidas en la Tierra. Su nombre proviene del griego, y significa “alimento de los dioses”. Cacao fue utilizado y cultivado por las antiguas tribus indígenas de América Central, como los mayas, aztecas y los Gunas como moneda. Su abundante oro fue utilizado como un mero adorno, ya que no podría ser tan valiosa como la que produjo la salud. Los científicos modernos están re-descubriendo los muchos usos medicinales del cacao rico en antioxidantes, incluyendo su capacidad para combatir el cáncer, enfermedades del corazón, diabetes tipo 2 y la depresión, mientras que estimula la función cognitiva, mejorando de la memoria y la inteligencia. El cacao es el componente más importante en la producción de chocolate. Mientras que los chocolates comerciales contienen a menudo grandes cantidades de azúcar, la leche de vaca y otras sustancias adictivas y tóxicas, sin duda es posible producir un chocolate de alta calidad utilizando sólo ingredientes saludables como el cacao, el coco, y un edulcorante natural como la stevia, la miel de abeja o la miel de maple. Otros estudios recientes han demostrado un efecto positivo sobre el colesterol, la tos, la pérdida de peso, la eczema, la enfermedad del corazón, la presión arterial alta y el cuidado de la piel. En mi centro de bienestar, varias mujeres informaron de una ausencia de síntomas de SPM después de una terapia de chocolate administrada antes del inicio previsto de los síntomas mensuales. 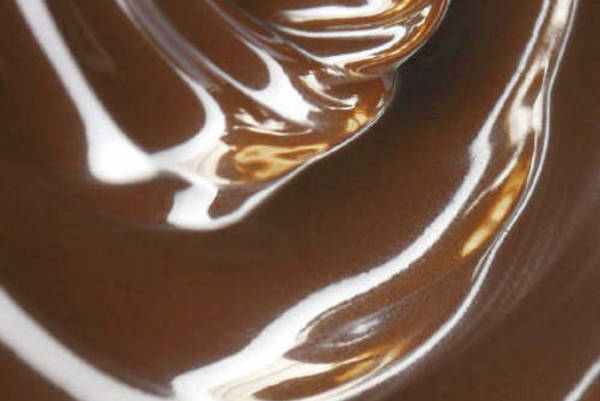 Esta terapia de chocolate consistía de pintar una salsa de chocolate en la paciente de la cabeza a los pies, permitiendo que la piel absorbiera los nutrientes, así como la inhalación del aroma del chocolate, y tambien de comer una pequeña cantidad de esta misma mezcla de chocolate. El chocolate ha sido considerado un afrodisíaco y un potenciador del estado de ánimo. El cacao crudo estimula la producción de endorfinas, de la dopamina y de la serotonina, neurotransmisores importantes que bloquean el dolor, mientras que crean placer y relajación. Las endorfinas son los analgésicos naturales. Cuando el dolor desaparece de repente, una sensación de euforia toma su lugar. La dopamina produce una sensación de alegría y aumenta el enfoque y la atención. La serotonina es nuestro antidepresivo natural y es importante para la relajación y el sueño. Cada uno de estos neurotransmisores son necesarios para una buena salud física y mental. Los niveles elevados de estos neurotransmisores puede producir una sensación de intenso placer y euforia. Es importante mantener us perspectiva correcta a los dos lados de esta moneda. Si bien la disminución del dolor y el aumento de placer y relajación son beneficios normalmente bienvenidos, dependiendo de de un unico nutriente para estimular estas funciones naturales puede llevar a la adicción y los síntomas de abstinencia desagradables si el consumo cesa. En otras palabras, el cacao puede ser considerado como una medicina, y es importante regular la dosis. Una estimulación externa excesiva puede causar que el cuerpo producza menos por sí mismo, lo que explicaría los síntomas de abstinencia. El Chicago Sun Times informó que las personas que sufren de la depresión extrema tienen una producción irregular de feniletilamina o PEA, una anfetamina que estimula los receptores de dopamina y aumenta el estado de alerta mental, el pulso, la presión arterial y los niveles de azúcar en la sangre. Cuando nos enamoramos, nuestro cerebro libera naturalmente phenylethlamine, produciendo tanto placer que puede ser adictivo. Los que tienen el corazón roto suelen automedicarse con el chocolate ya que el chocolate es rico en feniletilamina. La teofilina es un estimulante del corazón y el sistema nervioso central, relaja los músculos lisos bronquiales, y puede ser eficaz en la prevención y tratamiento de la apnea en la infancia prematura. La anandamida es un endocannabinoide. Los endocannabinoides se producen de forma natural en el cerebro, pero están más concentrados en la planta de cannabis, y en mucha menor medida, en el cacao. La imagen de arriba es una vaina de cacao entero, que crece directamente del tronco de un árbol en Centroamérica. La imagen de arriba muestra la vaina de cacao cortada por la mitad, dejando al descubierto las semillas cubiertas en un gel blanco dulce. En la foto arriba estan las semillas crudas cubiertas de gel viscoso blanco. Este dulce gel podria ser la clave para la prevención del cáncer y la enfermedad del corazón, ya que es consumida por la tribu indígena que no sufre alguna de estas enfermedades degenerativas. Casi no existen estudios sobre el consumo del gel, muy probablemente porque los países desarrollados normalmente sólo reciben el cacao procesado y nunca han tenido acceso a la fruta en su forma cruda. El nombre científico de la fruta del chocolate es “Cacaotero Theobroma”. Su composición química incluye un gran número de vitaminas, aminoácidos y otros fito-nutrientes… más de 300 compuestos en total. Los componentes de sabor incluyen polifenoles, ésteres alifáticos, carbonilos aromáticos insaturados, pirazinas, dicetopiperazinas, y teobromina. Por cada 100 gramos, la semilla contiene 456 calorías, 3.6 gramos de agua, 12,0 gramos de proteínas, 46,3 gramos de grasa, 34,7 gramos de carbohidratos totales, 8,6 gramos de fibra, 106 mg de calcio, 537 mg de fósforo, 3,6 mg de hierro, 30 mg de beta-caroteno, 0,17 mg de tiamina (vitamina B1), 0,14 mg de riboflavina (vitamina B2), 1,7 mg de niacina (vitamina B3), y 3 mg de ácido ascórbico (vitamina C). La Riqueza de la India informó que la pulpa comestible de la fruta contiene 79,7-88,5 % de agua, 0,5 a 0,7 % albuminoides, astringentes, etc; 8,3-13,1 % de glucosa, 0,4-0,9 % de sacarosa, un rastro de almidón, 0,2-0,4 % ácidos no volátiles (como ácido tartárico) , 0,03 % de Fe2O3 y sales minerales 0,4 % (K, Na , Ca, Mg) . Semillas crudas contienen 0,24 mg/100 g de tiamina, riboflavina 0,41 , 0,09 piridoxina, nicotinamida 2.1 , y 1.35 ácido pantoténico. El cacao también contiene alrededor de 18 % de proteínas, grasas (manteca de cacao) , aminas y alcaloides , incluyendo la teobromina (0,5 a 2,7%), cafeína (CA 0,25 % del cacao; 0,7-1,70 en los frijoles sin grasa, con forasteros que contienen menos de 0,1 % y criollos contienen 1,43-1,70 % ), tiramina, dopamina, salsolinol, trigonelina , ácido nicotínico, y amino ácidos libres; taninos ; fosfolípidos , y mucho más. Para comparar la cantidad de cafeína en una taza de 6 oz de diversas bebidas , me baso en información de Tyler y Palotti (6,7). The FDA, often criticized for allowing toxic substances to be sold as food, is taking a major step toward preventing disease. Hydrogenated oils, also known as trans fats, will no longer be “Generally Recognized As Safe” or GRAS for short. This means that manufacturers will no longer be allowed to sell them without first producing scientific proof that they are safe. And frankly, no one could prove such a thing, without resorting to fuzzy math, trickery, deceit and outright corruption. In 2006, the New England Journal of Medicine published a review article entitle “Trans Fats and Cardiovascular Disease” wherein that the authors cautioned against even conducting a long-term trial, saying that it would be “unethical, given the adverse effects of trans fats on serum lipid levels and inflammation”. Using hydrogenated oil instead of healthy oil helps the bottom line of the manufacturer by increasing the shelf life and lowering the cost of its products, but they are terrible for your body. Several studies have implicated trans fats in a variety of conditions like heart disease, cancer, obesity, diabetes, ADHD and Alzheimer’s. The World Health Organization reports that heart disease is the leading cause of death worldwide. “On a per-calorie basis, trans fats appear to increase the risk of Coronary Heart Disease more than any other macronutrient, conferring a substantially increased risk at low levels of consumption… In an analysis of nearly 140,000 subjects, a 2 percent increase in energy intake from trans fatty acids was associated with a 23 percent increase in the incidence of Coronary Heart Disease. Prior to 2006, the FDA did not require manufacturers to disclose the inclusion of trans fats on labels of their packaged goods. Americans were consuming a large daily dose of a deadly toxin without so much as a tiny warning on the label. Since the FDA began requiring that trans fats be labeled, the food industry has dramatically reduced the amount of trans fats used in its products. According to the FDA, Americans consumed about 4.6 grams of trans fats per day in 2003 compared to about 1 gram per day in 2012. Unfortunately, many products still contain these dangerous semi-solid oils and often people don’t read the labels, and some may not understand the dangers of trans fats. If the FDA’s current motion is successful in effectively banning trans fats from manufactured foods, Americans are likely to suffer 20,000 fewer heart attacks per year, and about 7,000 untimely deaths from heart attacks will be prevented. This measure, which is long overdue, sadly won’t come into effect immediately. The FDA made its decision to require trans fats to be labeled in 2003, but that measure did not come into effect until 2006. Although I do applaud the FDA for eventually making the right moves on this particular toxin, one simply cannot afford to rely on the FDA for food safety in the predictable near future. When you go to the supermarket, it would be wise to bring a magnifying glass to help you scrutinize every item that you will feed to your family. For the next undetermined time you must be on the lookout for trans fats under all its criminal aliases, including “partially-hydrogenated vegetable oil” , “margarine” and “shortening”.La FDA, a menudo criticada por permitir que las sustancias tóxicas que se venden como alimentos, está dando un paso importante hacia la prevención de la enfermedad. Aceites hidrogenados, también conocidas como grasas trans, ya no serán “generalmente reconocido como seguro” o GRAS por sus siglas en ingles. Esto significa que los fabricantes ya no podrán venderlos sin antes comprobar científicamente que son seguros. Y, francamente, nadie podria comprobar tal cosa, sin recurrir al engaño, o la corrupción descarada. En 2006, el New England Journal of Medicine publicó un artículo: ” las grasas trans y las enfermedades cardiovasculares”, en el que que los autores advirtieron que incluso la realización de un ensayo a largo plazo, sería “poco ético, dados los efectos adversos de las grasas trans en los niveles de lípidos en suero y de la inflamación”. El uso de aceite hidrogenado en lugar de aceite saludable ayuda a las ganancias de la fabricante al aumentar la vida útil y reducir el costo de sus productos, pero son terribles para su cuerpo. Varios estudios han implicado las grasas trans en una variedad de condiciones como la enfermedad cardíaca, el cáncer, la obesidad, la diabetes, el ADHD y la enfermedad de Alzheimer. La Organización Mundial de la Salud informa que la enfermedad cardíaca es la principal causa de muerte en el mundo. Antes de 2006, la FDA no requeria que los fabricantes revelaban la inclusión de las grasas trans en las etiquetas de sus productos envasados​​. Los estadounidenses estaban consumiendo una dosis diaria grande de una toxina mortal, sin ni siquiera una pequeña advertencia en la etiqueta. Desde que la FDA comenzó a exigir que las grasas trans se deben etiquetar, la industria alimentaria ha reducido drásticamente la cantidad de grasas trans que utiliza en sus productos. Según la FDA, los estadounidenses consumieron alrededor de 4,6 gramos de grasas trans por día en el 2003 en comparación con alrededor de 1 gramo por día en 2012. Desafortunadamente, muchos productos todavía contienen estos aceites semisólidos peligrosos y, a menudo la gente no lee las etiquetas, y algunos pueden no entender los peligros de las grasas trans. Si el movimiento actual de la FDA tiene éxito en prohibir efectivamente las grasas trans de los alimentos manufacturados, los estadounidenses son propensos a sufrir 20.000 menos ataques al corazón cada año, y se impedirá unas 7.000 muertes prematuras por ataques al corazón. Esta medida, que es desde hace mucho tiempo, por desgracia, no entrará en vigor de inmediato. La FDA hizo su decisión de exigir que se etiqueten las grasas trans en 2003, pero esa medida no entró en vigor hasta 2006 . Aunque aplaudo la FDA por finalmente tomar los pasos correctos en esta toxina en particular, uno simplemente no puede permitirse el lujo de depender de la FDA para la seguridad alimentaria en el futuro cercano previsible. Cuando vaya al supermercado, sería prudente llevar una lupa para ayudarle a analizar cada elemento que va a alimentar a su familia. Debe estar en la búsqueda de las grasas trans en todas sus alias criminales, incluyendo el “aceite vegetal parcialmente hidrogenado”, “margarina” y “manteca”. According to Dr. William Davis, a protein in wheat, gliadin, binds to opiate receptors in the brain, causing you to overeat. According to cardiologist Dr. William Davis, it is a perfectly-crafted poison to make you gain weight. No human should consume wheat. Eating wheat causes obesity, diabetes, hypertension, heart disease, cancer, dementia, autism and many other problems. Cut out wheat to lose up to 15 pounds in just 30 days. Dr. Davis is the author of the book “Wheat Belly” and has recently appeared on the Dr. Oz Show. Segun el Dr. William Davis, una proteina en el trigo, gliadin, se junta a los receptores de opio en el cerebro, lo que provoca comer mas. Esto significa que el trigo es un veneno perfecto para hacerle engordar. Ningun ser humano debe comer el trigo. El trigo causa obesidad, el diabetes, la hipertension, la enfermedad del corazon, el cancer, la demencia, el autismo y varios otros problemas. Eliminalo para perder 15 libras en solamente 30 dias. Dr. William Davis é cardiologista e autor da “barriga de trigo” do livro. Recentemente, ele apareceu no programa Dr. Oz. Segundo o Dr. Davis, uma proteína do trigo, a gliadina, liga-se a receptores opiáceos do cérebro, fazendo com que você a comer demais. O trigo é um veneno perfeitamente criado para fazer você ganhar peso. Não devem ser humano consumir trigo. Comer trigo obesidade causas, diabetes, hipertensão, doenças cardíacas, câncer, demência, autismo e muitos outros problemas. Corte de trigo a perder até 15 quilos em apenas 30 dias. A recent study published in the American Journal of Clinical Nutrition confirms that a vegetarian diet is among the best ways to prevent a heart attack. This study, produced by the scientists at the University of Oxford and published in the American Journal of Clinical Nutrition, analysed data from 15,100 vegetarians and 29,400 non-vegetarians. Over the 11-year study, 169 people died from heart disease and 1,066 were hospitalized – and these were 32 percent more likely to be non-vegetarians. The study also showed that the vegetarians had lower blood pressure, lower levels of “bad” cholesterol and had a healthier weight. Choosing a vegetarian diet is not enough in and of itself to ensure overall health, nor to eliminate the risk of heart disease. Some vegetarians in this study also suffered heart attacks, and some died. A diet that excludes meat but includes refined sugars and grains is still unhealthy, and leads to multiple types of diseases. Some vegetarians also smoke and avoid excercise. Stress also affects vegetarians and non-vegetarians. In general, vegetarians tend to be calmer than non-vegetarians (perhaps due to the hormones often found in animal products) but even an outwardly calm person may accumulate stress and anxiety inside, with detrimental health consequences. Este estudio, realizado por los scientificos de la Universidad de Oxford en Inglaterra y publicado en el American Journal of Clinical Nutrition, analiso los datos de 15,100 vegetarianos y 29,400 carnivoros. Durante los 11 años del estudio, 169 personas murieron de ataques al corazon y 1,066 fueron hospitalizados – y las victimas fueron 32 porciento mas propensos a ser carnivoros. El estudio tambien demostro que los vegetarianos tuvieron una presion sanguinia reducida, asi como los niveles del “colesterol malo” y tambien su peso. Adoptar una dieta vegetariana no es suficiente en si para asegurar la salud total, ni para eliminar el riesgo de la enfermedad del corazon. Algunos de los vegetarianos en este estudio tambien sufrieron ataques al corazon, y algunos murieron. Una dieta que excluye carne pero que incluye azucares refinados y granos es poco saludable, y conduce a multiples clases de enfermedades. Algunos vegetarianos tambien fuman y evitan el ejercicio. El estres afecta tanto a los vegetarianos como los carnivoros. En general, los vegetarianos tienden a ser mas calmados que los carnivoros (posiblemente debido a las hormonas presentes en los productos animales) pero aun una persona con un comportamiento calmado podria acumular el estres y la ansiedad adentro, con consequencias graves a la salud. El Dr. Crowe debio mencionar que solamente las grasas saturadas de fuente animal son perjudicial a la salud. El aceite de coco es una grasa saturada y es buenisimo para la salud. Este estudo, conduzido por cientistas do trabalho da Universidade de Oxford, na Inglaterra e publicado no American Journal of Clinical Nutrition, os dados do estudo de relatórios 15.100 vegetarianos e carnívoros 29,400. Durante os 11 anos do estudo, 169 pessoas morreram de ataques cardíacos e 1.066 foram hospitalizadas – e as vítimas eram 32 por cento mais propensos a ser carnívoros. O estudo também mostrou que os vegetarianos tinham uma pressão sanguinia reduzida, e os níveis de “colesterol ruim”, e também o seu peso. A adoção de uma dieta vegetariana não é suficiente em si mesma para garantir a saúde em geral, eliminar o risco de doença cardíaca. Alguns vegetarianos neste estudo também sofreram ataques cardíacos, e alguns morreram. Uma dieta que exclui a carne, mas incluindo açúcares refinados e grãos não é saudável, e leva a vários tipos de doenças. Alguns vegetarianos também fumar e evitar o exercício. Estresse afeta ambos vegetarianos e carnívoros. Em geral, os vegetarianos tendem a ser mais calmo do que carnívoros (possivelmente devido aos hormônios em produtos de origem animal), mas mesmo uma pessoa com um comportamento calmo poderia acumular em stress e ansiedade, com consequências graves para a saúde. Dr. Crowe debio mencionar que apenas as gorduras saturadas de origem animal são prejudiciais à saúde. O óleo de coco é uma gordura saturada e é ótimo para a saúde.